Sometimes, all you need is a little gold! 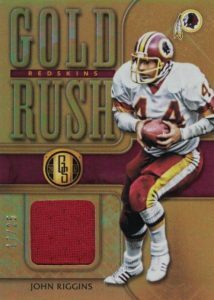 Back after a long break, the 2017 Panini Gold Standard Football checklist aims to fill that void with an ornate assortment of NFL hits. Every hobby box contains a total of five autographs or relics. While the one-pack product does not skimp on quality elements, collectors can still find a base set and Photo Variations for top players of past and present. Nevertheless, most fans are more interested in the various hits to uncover. 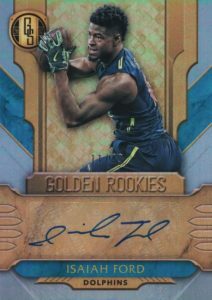 Taking center focus in 2017 Panini Gold Standard Football are the many Rookie Jersey Autograph options (1 per box), each numbered to 199 or less. 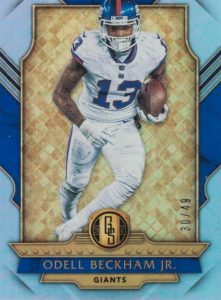 Additional versions include Patch - Gold Ink (#/25 or less), Tag - White Ink (1/1), Double Prime, Triple Tag and Jumbo NFL Shield for the top players of the 2017 draft class. Using the NFL's ultimate prize to celebrate all-time greats, Super Bowl Diamond Signatures Dual showcases two elite player autographs with an actual diamond set in the middle. 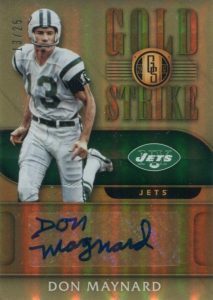 Other signed inserts include Good as Gold Autograph Relics, and Gold Jacket Signatures, which highlights Hall of Fame players. Combining with the autographs to fall five per box, memorabilia cards come in several designs. Gold Gear and White Gold relics offer Prime and Super Prime swatches, while Bullion Brand Tags (1/1) display jumbo laundry tag pieces. 200 cards. Serial numbered #/79. PARALLEL CARDS: Platinum #/49, Black 1/1. 15 cards. Limited to 10 copies. Base image has a light/white jersey while the variations have darker jerseys. 10 subjects. Each card is limited to 10 copies or less and total rarity is based on duration with each team. PARALLEL CARDS: Prime #/25, Tag 1/1. 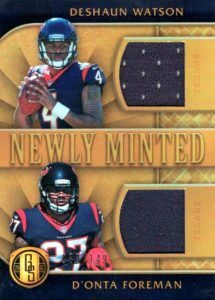 PARALLEL CARDS: Prime #/25, NFL Shield 1/1. 85 cards. Serial numbered 1/1. 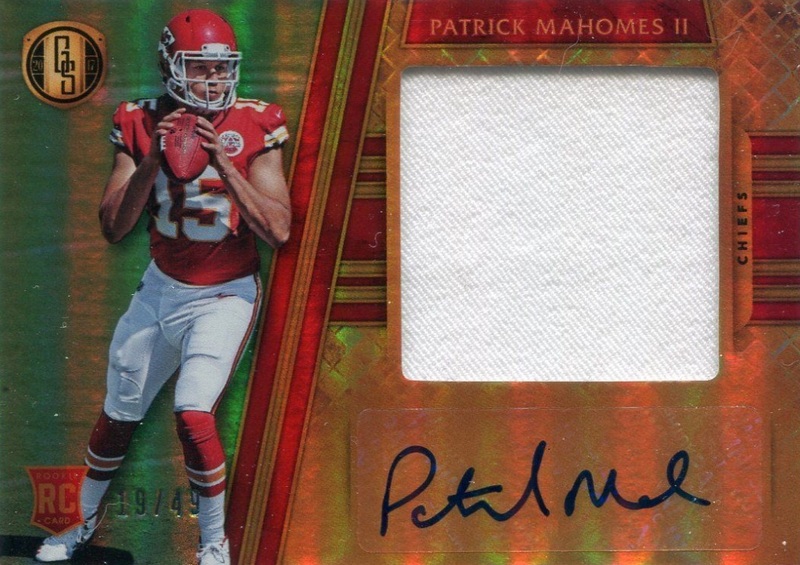 PARALLEL CARDS: Prime #/49 or less (No Namath, Flacco*), Premium 1/1 (No Namath*). PARALLEL CARDS: Platinum #/49 or #/5, Black 1/1. PARALLEL CARDS: Prime #/49 or less, Premium 1/1. PARALLEL CARDS: Platinum #/49 or less, Black 1/1. PARALLEL CARDS: Prime #/49 or less (No Kaepernick*), Premium 1/1. 49 cards. Serial numbered #/149. Shop on eBay. PARALLEL CARDS: Prime #/25 or less (No Tarkenton*), Premium 1/1. 38 cards. Serial numbered #/199. Shop on eBay. 9 cards. Serial numbered #/149. Shop on eBay. Off to a bad start. 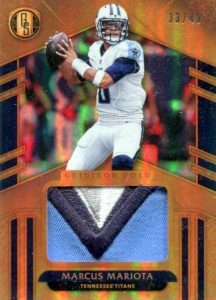 Dak Prescott pictured above with an “RC” imprinted on the top? Definitely not a rookie anymore. Hey Trey, I have a question about this product. Do you know how many base cards their will be to the set? No word yet on the base set size. As far as the Dak card, those are mock-ups to show the rookie design but final cards will use the actual 2017 rookies. Love how people submit ratings, or critique a product before it’s even seen. Read “mockups” , highly doubt Dak cards will have RC on them. 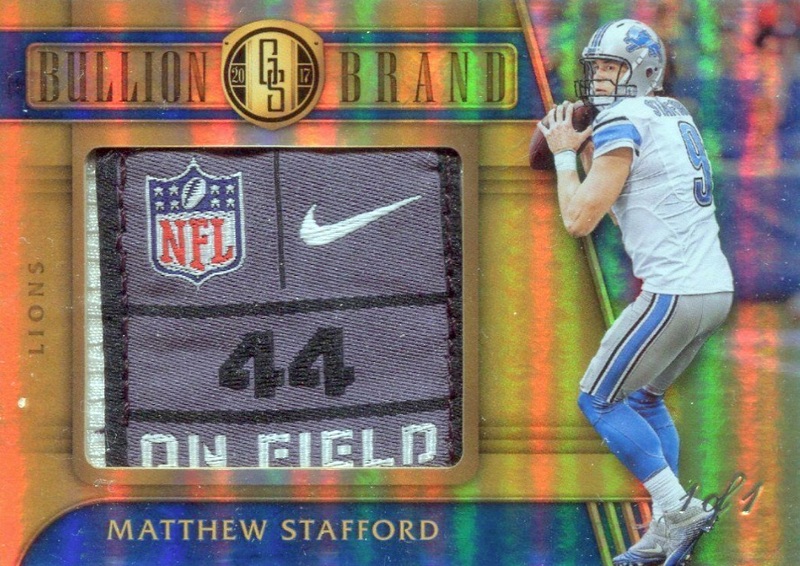 I buy some gold standard every year, just because I collect and buy something from every product, but some how gold standard be it football or basketball always disappoints me. This product is awesome! Not every pack will be stellar but if you buy by the case or go group break route, you should be very pleased, hence 4 stars. This covers the stars of today, rookies and past heroes/legends really nicely! My first football break was this stuff and got Arizona. Walked away with a Charley Trippi auto. 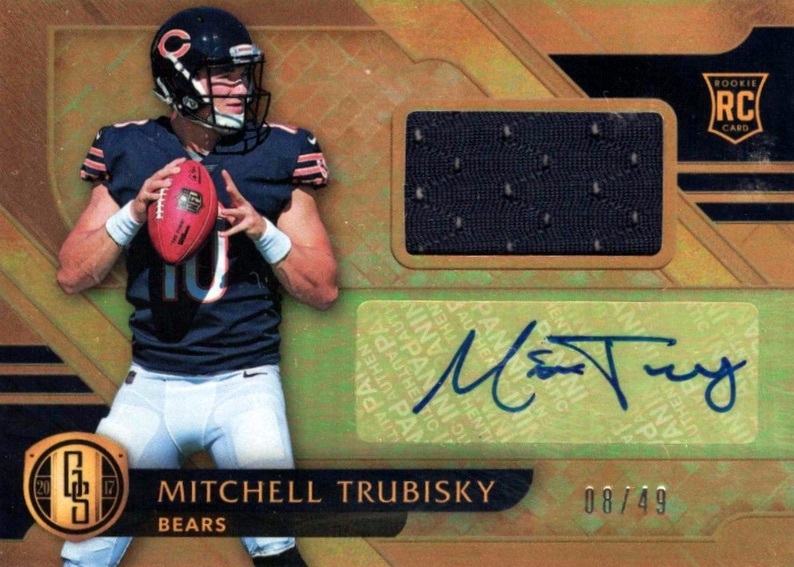 Seen Nike swoosh autos, NFL shield autos, a Terry Bradshaw auto. Highly recommended!!! 49ers, Eagles, Steelers, Chiefs, Browns and Bengals are the best represented from what I have seen!!! Gold standard? With sticker autographs? I don’t collect autographed stickers.